We won’t have to script out the decreasing incremental movements that simulate easing during a bounce, like we used to have to do in Actionscript 3 in Flash. All of that complex math will be handled by pre-written libraries. We simply ask for the type of bounce we want, name the object that needs to bounce, save the file, and refresh the browser. We could do this animation in CSS 3, but at this point in time (2017) , scheduling events on a CSS timeline is very cumbersome. We won’t be using storyboards, but keep in mind that most animations start with storyboards. If you’ve never seen one, a storyboard is a series of stick figure cartoons, like a comic book page. An animation banner typically starts with a client who has something to sell. There is usually an image involved, accompanied by some descriptive text. Planning the sequence of animated events that will sell the product typically starts with a storyboard. For this tutorial, I’m going to give you the finished animation in a zip file, complete with drag-able playhead. It will contain all the files required to build this animated banner. But be aware that to move this animation up to your web server, you will need to be familiar with ftp file management applications, such as filezilla, cPanel or Dreamweaver. If you are in my college class, it will be a sub folder in resources named animated-banner. Copy that folder to a location on your hardrive, desktop or network where you normally develop websites. The process I used to reverse engineer it can be used on any animation. Because it was a fast running animation with some exquisitely timed transitions, it was very challenging to figure out the timing. I needed a playhead to examine the movements in tiny increments. My solution was to record it with screen capture software. There are numerous programs out there, including some free ones, but I used Camtashia. Once I had it recorded, I exported it as an mp4 and had my playhead. Once I could examine it in slow motion, I built an illustrated storyboard showing all the various elements and how they related to each other over the course of the 10 second animation. I made the illustrations for the storyboard by simply pausing the video and taking screenshots. I pasted the screenshots into Illustrator, then exported the Illustrator file as a PDF. Open this pdf. I’m also embedding it in this site, but the pdf has better image quality. With experience and knowledge you can skip some of these steps…but for a beginner, or if the project is super complex, it’s always good to start with a storyboard. If you are using a code editor such as Sublime or Brackets, make sure that those editors open with empty sidebars and zero files open. In Sublime, for example, it typically starts up with the last used files open, and the last defined project files listed in the sidebar. Each editor is different, but do what you have to do to close old files, and remove old project folders from the sidebar. If you don’t know how, ask Uncle Google. Dreamweaver has some distinct advantages for developing animations, however at this time I don’t have Dreamweaver, so I will be using Sublime. STEP 1: Open the banner-done.html in your browser and watch it run, note that you can drag the slider bar to control the animation, and that it keeps up with the animation automatically if you hit refresh. We will also bring in the progress slider so that we can use it to speed up our testing during the development of the animation. STEP 2: Close banner-done.html and open banner-start.html in Firefox. NOTE: only Firefox will work for what I’m about to show you. The banner-start.html will be a blank window in the browser, this is normal. STEP 3: Right click in the blank browser window and choose view > source. Firefox will open a new tab showing the source code. Note all the links to external files. Lines 6, 12, 13, 14, 15 and 16 all have links to external files. These files get imported by the browser and are essential for the animation to work. If you like analogies, think of the the engine in your car. If you took it out and set it on the floor, it wouldn’t run. It has to mounted in the car, and it has to be connected to the battery, the gas tank, the air cleaner, the fuel pump…etc. STEP 4: Click each of the links and make sure that Firefox can open the linked files. They should open easily. Click the browsers back button after checking each link. 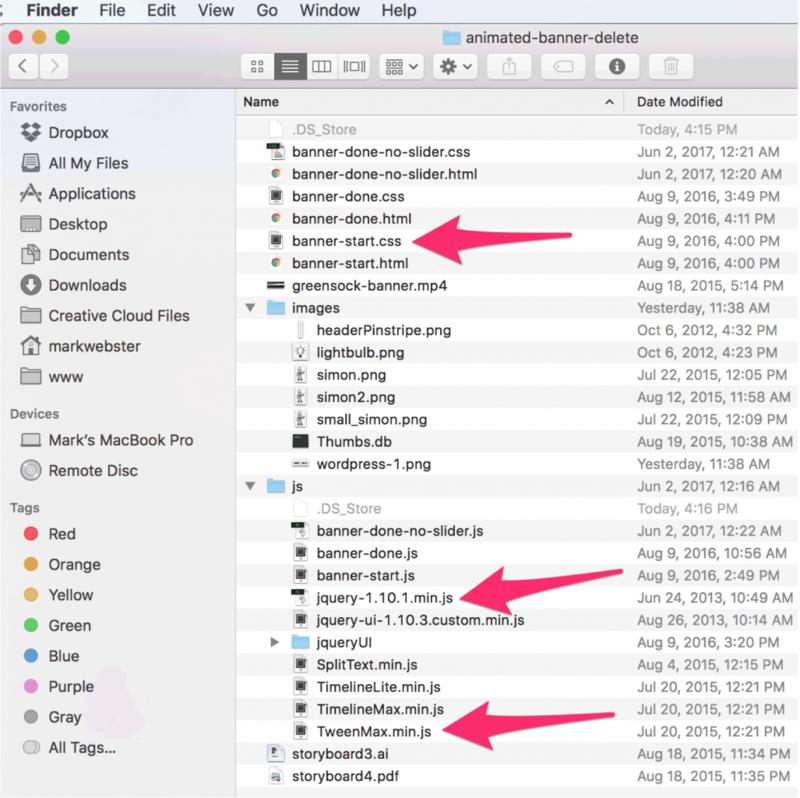 If the links don’t open, examine the folder using Windows Explorer or the Mac Finder. Your folder structure must look like this for you to be able to click the links in the view source window. NOTE: this screen shot is from a Mac, but windows explorer view is almost identical. NOTE: You can work this tutorial without buying the greensock book. My previous students and I figured it all out by watching his excellent youtube channel. But his book makes it soooo much easier, I highly recommend you buy the book. STEP 7: Add these two rules to banner-start.css. Save the file and refresh your browser. and refresh your page, you should see nothing. Next we will animate in the appearance of the banner. 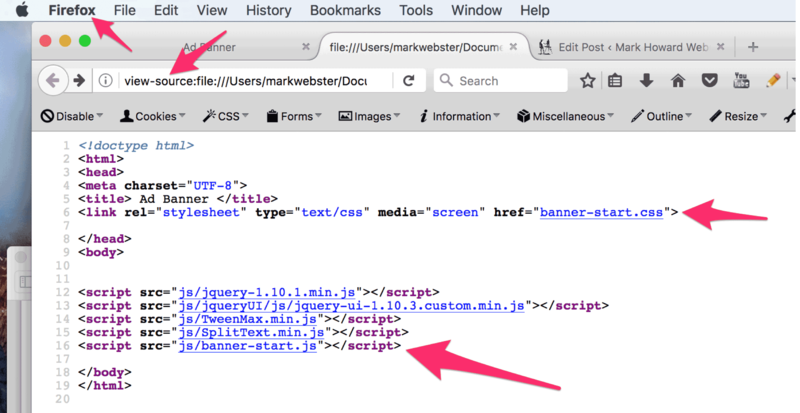 STEP 11: On banner-start.html, get rid of the “123” inside the banner div. Add a wrapper div, and two div’s inside that as shown. STEP 12: Switch to banner-start.css, add the following two new style sheet rules below the existing rules. Note that both elements #quote, #bouncyGreen have a float: left; property. Because #bouncyGreen div comes after #quote, #bouncyGreen is the last one to float into place, and ends up on the right, exactly where we want it. STEP 13: Switch to banner-start.js. Add the the code shown below. The new code is on lines 2 and 5. Save the file and refresh the browser on banner-start.html. You should see the words “We make the best mufflers” animate in one after the other, separated by about a tenth of a second. 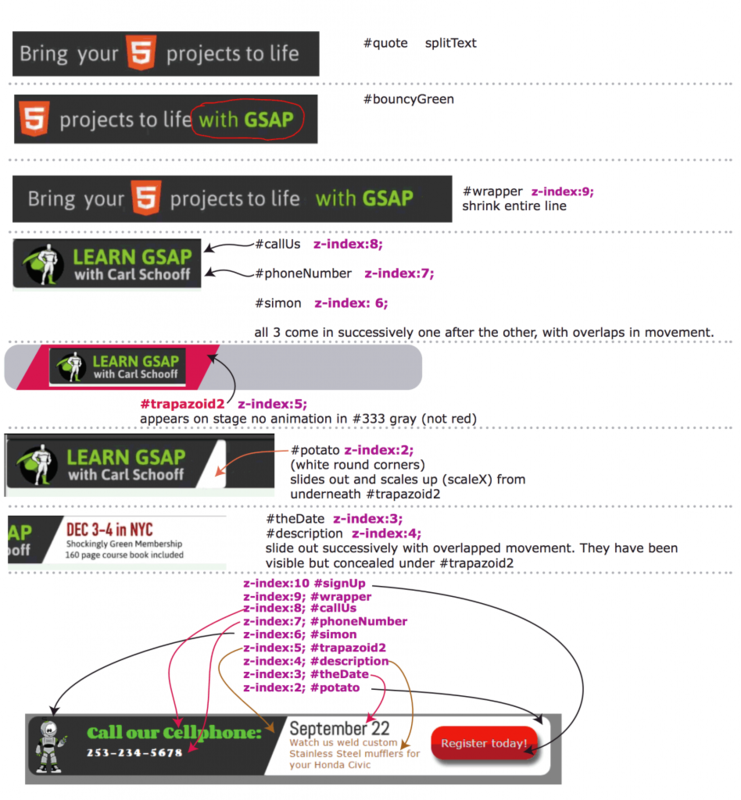 Explanation: Line two creates a new variable called mySplitText. It makes a new occurrence of the greensock SplitText function. The function targets the #quote div, and specifies that the type of splitting that shall occur is words, instead of individual letters. The SplitText function breaks apart the sentence into individual div elements so that each can be animated separately. Line five uses the greensock staggerFrom function. The staggerFrom function means to separate out the words into staggered animations, each separated from the previous word by 0.15 seconds. We specify the zero opacity and a scale of 0.4 (40%) as the starting point at which we start the animation from. We delay the animation on line 5 from following too closely on the heels of the animation on line 4 with the value of 0.3 seconds. You can see the new code in place below on line 6. This code targets the words “in Tacoma”, which are themselves surrounded by a #bouncyGreen div tag. That tag has been styled with CSS to be green, larger, and to float left until it runs into (floats left toward) the #quote tag. It is there because I wanted to target the entire sentence after it is done splitTexting and bouncing into place. Now that it has arrived, I’d like it to vanish so I can start in on the next series of animations. But rather than simply blinking out, wouldn’t it be cool if we could make it rear up like the character in the road runner cartoon, pause for a moment, then scream out of view? That is easy to do by simply giving the wrapper div a command. Note that it speaks to the #wrapper div, which has two descendant elements. Over the course of one second we are animating it to an opacity: 0, while scaling it down to 0.3 (30%), while simultaneously lowering it to a y:22 position. This keeps it approximately centered vertically as it shrinks. And we are delaying the start of it’s animation until half a second after the previous line of animation. Save the file and watch it run. You should see the sentence animate in, then rear up and vanish by shrinking to infinity. This will leave you with a blank gray round corner banner. Now that we’ve pitched them our advertising slogan, let’s tell them who we are by animating in our company logo and our phone number. The image I’m using should have been in the zip file you downloaded or got from the college resources folder. If you’d like to use your own image, be aware that it must measure 52 x 88 pixels, and you need to export it out of Photoshop as a PNG-24 with transparency enabled. To make that image, I dragged an Illustrator file into Photoshop. You could also take a picture of yourself, or whatever it is that you are selling, remove the background so it has transparency, shrink it down, then export it (file > export > save for web legacy) as a PNG 24 into this images folder. As long as you save it with the same name, and make it the same size, it should be able to replace mine and animate with all the same code. STEP 17: On banner-start.css, add the following three style sheet rules to control the three DOM elements we added in step one. These new rules go below all the other rules. Save the file and view the animation. A couple things in this new code bear explaining. Higher in the style sheet code, not shown here, you may not have noticed that I have already told the #banner div to have a position: relative property. This is required if you’d like to have the freedom to place the banner anywhere on the webpage. By using position: relative; we are able to use position: absolute; on elements inside the #banner div, and not have to worry about where those descendant elements are being positioned relative to the body of the web page. We can use positioning numbers (position: absolute; top: 45px;) that are measured from the perimeter of their parent which is #banner. STEP 18: On banner-start.js, add the following code below the existing code, shown as line 8 below. Refresh the page and note how the “Call Us” text slides in from the side. This is done by positioning it to an x value of negative 430. So instead of telling it to be, for example: 40 pixels from the left of the edge of it’s parent, we tell it to be x:-430. This moves it offscreen out of view 430 pixels to the left. If you like analogies, imagine a tube of lipstick laying on it’s side. The lipstick (cherry red of course) could be said to have a negative x value equal to it’s length. It is there, but it’s negatively positioned inside the plastic tube. To animate the #callUs element into view we tell it to come in from x:-430. After the animation, it arrives at it’s resting spot, which we defined in the CSS. STEP 19: On banner-start.js, add these two new commands at the bottom, shown as lines 9 and 10 below. Save and refresh the page. Note how all three objects slide into view very quickly. If you watch carefully you will see that the #callUs is the first one to come into view, but while it is still moving the other two elements (#phoneNumber & #simon) are also moving into view. They are all moving simultaneously. I have to give a shout out to the fine folks over at greensock. This is beautiful work. The way they did it…or at least the way I have recreated it, is with the odd looking code at the end of each command. Normally we would have a delay there, but instead, notice how I’ve inserted something in between the closing curly brace and parenthesis. What I’ve inserted is a comma followed by a string value (data inside double quotes) that acts as a reverse delay. Instead of letting each element animate sequentially, and or after a delay value, I’ve used this string value: “-=0.4”. This means, take the current time at which it would have animated, and make it equal to that time after the browser has subtracted four tenths of a second from that time. This allows us to have something happen during, or even before the previous animation command. Bottom line is that these string value delays allow concurrent and or overlapping animation movements.